Well, as you know my lovelies, Sundays are my fundays, and today I decided to try out a technique I have seen often, but never tried! 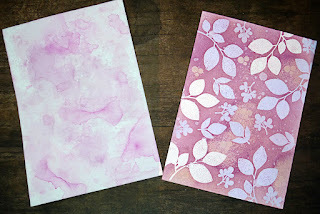 The layered embossing technique! However, it wasn't successful for me, because I am far too impatient, plus, I forgot one vital stage . . . I will explain. First, I will show you the piece. Those of you who have tried this technique and been successful will probably see where I messed up. 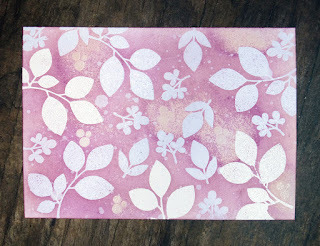 The first layer of leaves were OK, but when I did the second layer I forgot to go over the background again with another layer of Distress Ink, before heat embossing the third layer, resulting in far too many images of the same colour! The next big mistake, was being far too impatient and not drying the next layer of Distress Ink thoroughly enough, which resulted in a mess around some of the images, if you look closely, you will see about four different patches where the clear embossing powder clung to areas that weren't quite thoroughly dry. As I'd already made a mess of it in this way, I decided to distress it even more by sprinkling some water droplets on it and mopped them off with some tissue, turning it into more of a 'shabby chic' piece. I will give this another go one day and try and get it right next time! 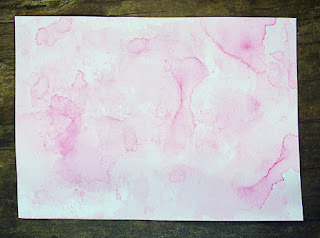 Then, I sprayed water on my craft mat to wipe up the ink, but instead of grabbing the old towel I keep for mopping up, I decided to grab a piece of water-colour card instead and mop up with that. This is my 'mop up' piece. What did you get up to today? I hope it was fun! Hazel, so glad you had fun today! It's funny how sometimes the techniques we work so hard on are just as effective as swiping some paper across the left overs! They are both great! I am NOT familiar with this technique! I think it is pretty, and your mop up background too! I think both your pieces are quite pretty, and you've inspired me to try the distress ink/embossed technique. Hope you had a wonderful weekend. I think your card is very pretty. When we mess up on cards we say...smears to you!! It looks like you had a fun day and I am going to try that technique! I made the same mistake about not letting the ink dry! You had the right idea and beautiful colors! Love that mop up piece! Oh, if I had a nickel for every piece I messed up I'd be rich for sure! Bravo to you for showing us your experiments. I'm sure I wouldn't be so brave! And they both look pretty good to me so I look forward to seeing them used in a creative way in the future! 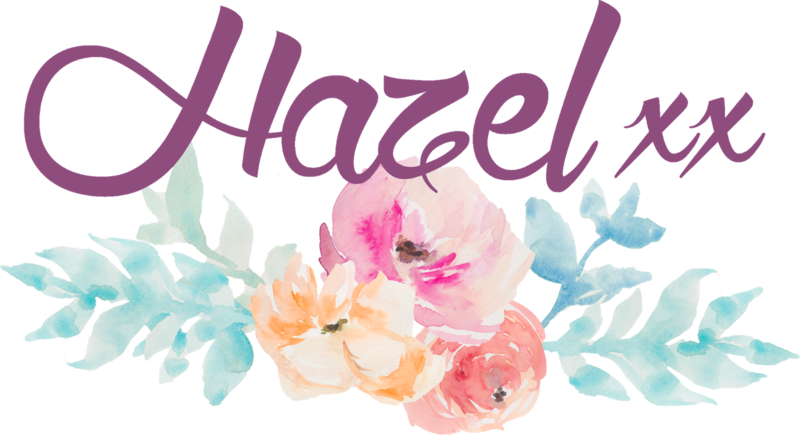 Oh, I enjoyed this post, Hazel ...and BTW, I think both your pieces look great, my friend!!! Definitely nothing messed up on these - can't wait to see how you have used them!! !